The instructions in this Section cover removal, installation, cleaning and inspection of all ball and roller bearings used in the various units of the vehicle. 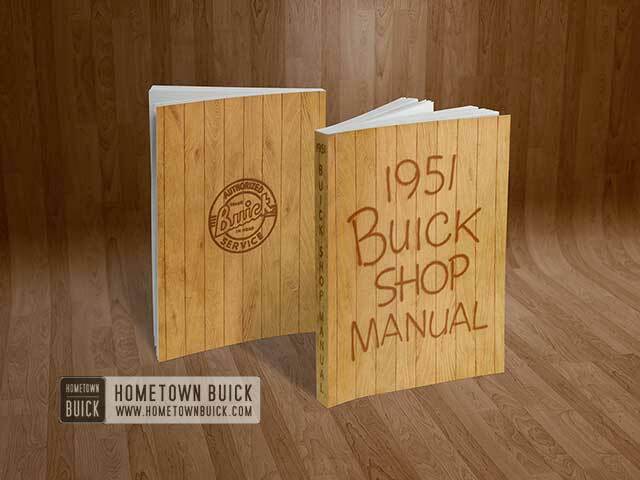 These instructions must be carefully followed to avoid failure of 1951 Buick bearings after any repair work in which they are involved. Absolute cleanliness is essential in the handling of all units in which ball or roller bearings are installed. Before any such unit is opened for inspection or removal of parts, all loose dirt should be washed off the exterior to avoid getting abrasive substances into the 1951 Buick bearings. Removed 1951 Buick bearings must be handled so as to avoid contamination as described below (par. 1-10 and 1-13.) During the installation the housing and all interior parts, as well as the tools used for assembly, must be kept absolutely clean. If a partially assembled unit is to be left standing for any time, or overnight, cover it with clean clothes or paper to exclude dust. Proper tools must be used during removal and installation to avoid damage to 1951 Buick bearings and adjacent parts. Special tools are designed for removal and installation of some bearings and these should be used where specified in instructions. When special tools are not available, an arbor press should be used, wherever it is adaptable, to apply pressure and avoid shock. Never hammer on a 1951 Buick bearing as the hardened steel may chip or crack. Use of a hammer and drift is bad practice. The drift may slip and damage the separator or shield and there is always the danger of cocking the 1951 Buick bearing or cracking the tight fitted race. If a hammer and drift must be used, the drift must be of soft material, such as brass, and properly shaped to assure good bearing against the tight fitted race. A clean piece of tubing of proper diameter to bear all around the race is preferable to a solid drift. 1951 Buick bearings may be seriously damaged by improperly applied pressure during removal or installation. Bearings should be pressed on or off and not driven, as the shock produced by driving may cause cracking, chipping, denting or brinelling of the hardened surfaces. Always apply the pressure against the particular race which is a tight fit on or in the part to which 1951 Buick bearing is assembled, so that the pressure is not transmitted through the balls or rollers. Never press or drive on the loose race. Never attempt to mount a 1951 Buick bearing on or in a part where the bearing seat is distorted, burred, or scored. The 1951 Buick bearing seat must first be trued and smoothed up and given a light coat of oil. Never apply full force against a bearing until assured that the bearing is started straight. Forcing a cocked bearing distorts the tight fitted race and may cause it to crack; furthermore, the extremely hard race is likely to distort, burr, or score the bearing seat of adjacent part. The same rule applies when removing the 1951 Buick bearing. Do not drop 1951 Buick bearing on floor or on other parts on bench. Never spin ball or roller bearings, especially not with an air hose. Considerable damage can be done if a bearing is spun at high speed; furthermore, this is a useless procedure since the condition of a 1951 Buick bearing cannot be determined by spinning, even at low speed. Very few 1951 Buick bearings removed in service work are entirely free from dirt or other foreign substances. In a majority of cases there is enough dirt present to affect the “feel” of the bearings and give the impression that they are rough or noisy. This is particularly noticeable in the double row ball bearings due to their initial preload. The condition and serviceability of ball and roller bearings that have been in service cannot be judged until they are thoroughly cleaned, lubricated, and inspected as described below. Do not lay 1951 Buick bearings down on a bench where dirt and metal particles are liable to get into them. Keep 1951 Buick bearings separated from other parts to avoid damage and contamination with foreign substances. Immediately after removal of bearings wrap them in dry, clean paper until they can be washed, lubricated, and inspected as to fitness for further service. Be sure wrapped bearings are well lubricated to prevent rusting. 1951 Buick bearings having seals or shields on both sides should never be washed since the lubricant may be diluted or washed out. Wipe exterior dirt from such bearings with a clean cloth. Bearings (not sealed on both sides) should be thoroughly washed in clean gasoline or kerosene which has not been used for other parts. It may be necessary to soak very dirty bearings in the cleaning fluid for some time, to soften hardened dirt and lubricant so it can be washed out. String a 1951 Buick bearing on a wire and slosh it up and down in cleaning fluid to wash out old lubricant and dirt. A 1951 Buick bearing having a shield on one side only should be strung with shielded side up to permit dirt to drop out readily. After sloshing on the wire, the bearing should be rotated and sloshed in cleaning fluid by hand to complete the removal of all foreign substances. When soaking or washing 1951 Buick bearings, use care not to contact bottom of container and thereby pick up any dirt that may have settled. Do not string several bearings on wire as the lower bearing may become contaminated with dirt or metal particles washed from upper bearings. Owing to their greater width and construction, double row bearings require a very thorough washing to remove all dirt or other foreign substances. After washing, blow out 1951 Buick bearings with clean, dry air. Let air run a while before turning it into bearings, to eliminate line dirt and moisture. Direct the air stream squarely into the open side or face of 1951 Buick bearing while holding the inner race and slowly rotating the outer race by hand. Continue until all loose dirt is removed. The air stream must not be directed so as to spin the bearing while cleaning, because a very high speed can be attained and considerable scratching and scoring will be done before the dirt is blown out. After the 1951 Buick bearing is thoroughly cleaned, oil bearing with clean new engine oil, rotating the bearing by hand to distribute the lubricant to all surfaces. If bearing is not to be inspected immediately, wrap it in clean, oiled paper to protect it from dirt and dust. Most ball and roller bearings fail from preventable causes. When bearings are inspected after cleaning and found to be unfit for further service, the cause of failure should be determined in order to avoid repetition of failure when new bearings are installed. 1951 Buick bearings rotated by hand for internal inspection should be under enough axial pressure to bring balls or rollers firmly into contact with race-ways. In case of single row angular contact bearings, pressure must always be applied on the thrust faces of races. Single row radial bearings normally have a certain amount of looseness or end play which is easily felt when dismounted. Single row angular contact bearings are very loose when dismounted and this greater looseness must not be mistaken for wear. Double row angular contact 1951 Buick bearings are preloaded or made to minus end play and therefore should have no end play that can be distinguished by hand feel. Cracked race. Forcing a cocked 1951 Buick bearing on or off a shaft will do this, as will too heavy a press fit. Rusted balls, rollers, or raceways. Usually caused by water passing worn or defective seals or by condensation inside housing. Worn, galled, or abraded surfaces. Can be caused by too loose fit or adjustment, or bearing locked by dirt and turning on shaft or in housing. Broken or bent shields, seals, or separator. Usually caused by improper use of tools during installation or removal. Badly discolored balls, rollers, or races. Usually due to inadequate supply of lubricant or improper type of lubricant. NOTE: Moderate discoloration of bearing parts is not cause for discard. Flat spots on rollers. Usually caused by improper fit or wrong lubricant. Extreme roughness. Roughness following thorough cleaning and oiling indicates damage to raceways, balls or rollers such as indenting by dirt or metal particles, or pitting by corrosion. Very slight roughness from light indentations seldom affects the bearing life and is no cause for discarding bearing. Extremely rough bearings will be noisy in operation and may soon fail in service, therefore they should be discarded. Rough or “catchy” feeling at one or more points. A rough or “catchy” feeling at one or more points as bearing is rotated indicates spalled or chipped spots due to fatigue or shock. Thorough flushing is necessary to make certain this condition is not caused by dirt or metal particles. Excessive looseness or end play. Excessive looseness or end play is caused by lapping of bearing parts by abrasive material in the lubricant. Races and balls or rollers are dull gray when lapped by abrasive material. Any looseness or end play in a double row bearing which can be detected by hand feel is cause for discarding bearing. Excessive looseness in a single row radial ball bearing is cause for rejection; if in doubt, check against feel of identical new bearing. Angular contact ball or roller bearings usually can be adjusted during installation to take care of a reasonable amount of wear due to lapping action of abrasive material in lubricant; however, an excessively worn bearing should be discarded. Cleaned 1951 Buick bearings. Bearings that are satisfactory for further use after cleaning and inspection must be carefully protected to avoid damage or contamination with dust or other abrasive substances. Immediately after inspection, thoroughly oil bearings to prevent rust and place them in a clean, covered container or wrap them in clean oiled paper until ready for installation. Dry paper, if used for wrapping, will absorb oil from bearing and promote rust. Avoid handling bearings more than absolutely necessary. Even when coated with oil, a bearing can become rusted in a comparatively short time by contact with the salty moisture deposited by the fingers. New 1951 Buick bearings. Store new bearings in a place that can be kept reasonably clean and not subject to extremes of heat or moisture which would promote rusting or deterioration of bearing lubricants. In order to minimize possibility or rusting or lubricant aging in storage, always use the oldest bearings in stock first. Keep bearings sealed in original containers ­ don’t open containers and handle bearings. If not protected, a new bearing can quickly pick up enough dust, even in an apparently clean place, to seriously affect its life and operation. Handling promotes rust from salty moisture deposited by fingers, even when bearing is oiled. Do not remove new bearings from their wrappers until ready to install. Do not clean out grease in which bearings are packed; it is important to leave this untouched.